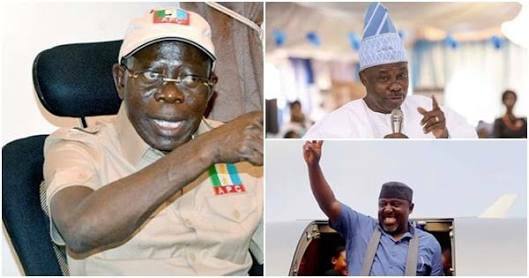 The All Progressives Congress is worried by the decision of some aggrieved members, including the Ogun State Governor, Senator Ibukunle Amosun, and his Imo State counterpart, Rochas Okorocha, to shun the APC governorship candidates in their states. It was, however, learnt by The Punch that despite the statement of Oshiomhole, the party leaders were concerned that some aggrieved members could spoil the chances of the APC. This, a source said, informed the decision of the party to convene a consultative forum with governorship candidates, state chairmen and secretaries at the national secretariat of the party in Abuja on Thursday. The source stated, “The party is disturbed by the tales from some states and decided to tackle the issues head-on so as not to play into the hands of the opposition Peoples Democratic Party (PDP). Another chieftain of the party, who would not want his name revealed because of the sensitive nature of the issue, cited Imo, Ogun and Zamfara states as places with high number of dissenters. 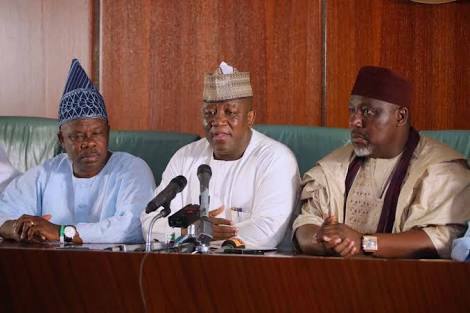 Okorocha, Amosun and the Zamfara State Governor, Abdul-Azeez Yari, are aggrieved that their preferred candidates did not get the tickets of the party. The source said, “In Imo, Governor Rochas Okorocha has allowed his son-in-law, Uche Nwosu, to pick the nomination form of another party while he remains in the APC to contest the senatorial seat. We see this as handwriting that the governor will work against the party in the governorship election. “His position and body language is sending wrong signals to our members, so we need to quickly move in to motivate our members in order to heal many wounds as may be possible. Many of them think the crisis must be handled fast to avoid a gale of defections. Plateau Governor, Simon Lalong, confirmed this fear in his opening remark at the consultative meeting. Lalong said, “We have started to hear people say that they will campaign for the president, not the governor. The party structure is one and if they are not going to campaign for the governor, don’t campaign with us. Lalong urged the APC to release the campaign council so as to start working for the party. “That is why I am also of the opinion that the earlier you release the campaign council, the better. Some of the items we intend to build into our campaign slogan are also for the president,” he added. Also speaking, the Niger State Governor, Mohammed Bello, stressed the need to bring back aggrieved members.